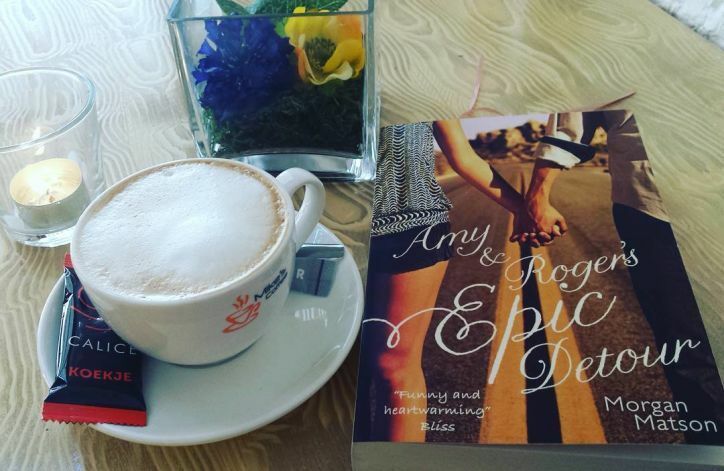 Amy & Roger’s Epic Detour – Book Review! As my final book for BookTube-A-Thon, I wanted to finish it off with a bang. I still needed to complete the “read a book with a person on the cover” and this book fit the bill. Amy & Roger’s Epic Detour has been on my shelf for a long time. It also took me forever to track the book down. Eventually I found the book while on holiday in Liverpool! Finally I can say I have completed it, and I was over the moon with the story. Here is my review for Amy & Roger’s Epic Detour! Amy & Roger’s Epic Detour picture from Instagram. For most people, summer is their favorite season. But this year it is not so fun for 17-year-old Amy Curry. After a terrible car accident that ended the life of her father, it is the last thing she wants to be thinking about. After a phone call from her mother, she needs to travel across America in the family car to move from California to Connecticut, their new home. But this would not be easy for Amy because she is now terrified of driving. Knowing this, Amy’s mother assured her that she would not need to drive. She has enlisted the help of an old family friend who will happily travel with Amy across America. Roger, who is the son of family friend needs to go to Philadelphia to spend the summer with his father, so is willing to bring Amy and the car to the other side. Once there he would get a train over to Phili. While Amy struggles with the death of her father, so too is Roger suffering with a different sort of loss. Throughout the road trip, Amy and Roger soon start to discover their own paths. Not one that is written out by a mother, but one of their choosing. Will Amy find a way to climb over the wall of feelings and heartbreak? It is time to buckle up and begin an epic road trip that neither of them expected. Amy & Roger’s Epic Detour was such a joy to read. Now only was the story heartbreaking because of Amy’s loss, but the journey was thrilling. While reading, I seriously felt like I was in the car beside them. I got to experience what a road trip would be like in America. It has actually been something I have thought about doing at one point in my life. A bucket list item! How Matson managed this was great. Another aspect I loved was the scrap booking. Throughout the story, various pictures and notes would be shown. Pictures of locations that Amy & Roger visited during their journey. These were usually accompanied with notes with information about the area or random tidbits about conversations. Playlists were also shared in the form of notes to show what they listened to throughout the journey. Most of these playlists were created by Roger since Amy didn’t want to play her musical music. Because of these playlists, I now know what music I want while road tripping! All of the characters in Amy & Roger’s Epic Detour were beautifully written by Matson. Each of them had their different roles to play which made me laugh, cry and feel super emotion about. They also helped in varying ways to help Amy without her knowledge overcome to burden of losing her father. Amy as a character was super intricate and well thought out. She absolutely loves acting and musicals but worries that other people would hate her music. The fact that she has also needed to deal with her father’s death alone is so sad. Her mother moved away a month before the start of the story and her brother had to be sent off for help. Amy did not like the idea of suddenly being together with someone for a long period of time. It makes her feel anxious, but thankfully as time goes on she starts to overcome this. She is such a brave girl who is willing to do things along the way that she would usually say no to. Being rebellious for once, going against what her mother planned for her. She wanted to take her own journey, and this in turn helped her meet new people as well as overcome her father’s death. I also loved how flashbacks played a major role in the narrative. These really enhanced Amy’s character and allowed me to feel more connected to her and her family. How she once upon a time used to be close to her brother, and how she was her fathers navigator while on trips. The flashbacks were a beautiful reminder of her past and they showed just how hard it was for Amy to open up about it. About how hard it would be for her to move forward. Roger is such a sweet and lovely character. He was willing to let Amy open up, but he did not push her into things. The way that Matson developed his character over the story was endearing. Roger was also someone who unlike Amy who wanted to bottle up her emotions, had a problem of his own. A loss that he was willing to face head on and “fix”. Thankfully Amy was willing to go along with him to do so (going back to my “usually would have said no” thing). Roger was really the Yin to Amy’s Yang in my eyes. One was secretive and closed up and the other was open and willing to face problems. Matson made this aspect the selling point of the book for me. 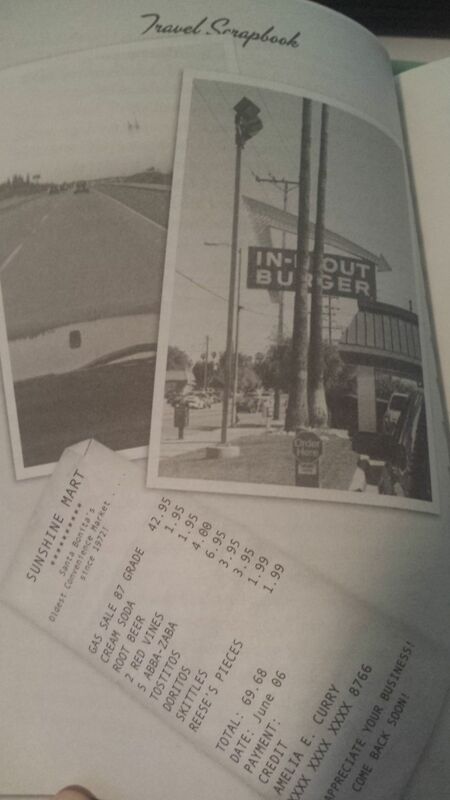 How both of them were different in their own ways, but somehow managed to go on this road trip and “find” each other. I also adored the side characters in Amy & Roger’s Epic Detour. Every single one of them in some form or another played a vital role into helping Amy break the barrier of regret and pain with her father. They gave her advice that may not of seemed like much at the time, but made Amy start to re-evaluate her life. They definitely improved the progression of the story and without them, I honestly don’t think the book would have been as good. My favorite side character was Leonard. For one, he was a gamer (and yes, I am a little bit biased with that). He also provided one of my favorite quotes in the book which I think is relatable on so many levels. It’s so true. Even if that destination isn’t going to happen anytime soon, just getting there is the good part. I love that. Amy & Roger in a cafe! This book was so beautifully written by Matson. The journey that Amy & Roger took was not only a journey through America, but also a journey about letting go. A journey about opening up and letting people back into your life. Even if that meant tears would be shed. I loved absolutely everything about it! The story was brimming with amazingly written characters and packed with emotion. I absolutely adored the relationship between Amy and Roger, and as time went on they discovered that their paths were meant to cross. The story was based not only about the trip, but on Amy’s life. About her family, her father and how she had really given up on caring. Seeing how she progresses through the story is incredibly beautiful and emotional and tears were shed! This is a must read for anyone who loves journeys of epic proportions, relationships and Elvis. Yes, you will want to listen to Elvis after you have read this book. You may even find yourself feeling emotional about doing so! 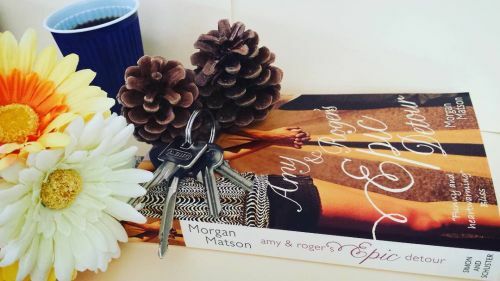 Amy & Roger’s Epic Detour by Morgan Matson, a wonderfully emotional book about loss, relationships and unwritten journeys gets a tearful and well deserved 5 out of 5 flails! I’ve been meaning to read this book FOREVER. (I’ve actually been meaning to read a Morgan Matson book for forever BUT ANYWAYS). I love books that have multi-media aspects and well-written characters/plots so I will for sure have to get to this one soon. 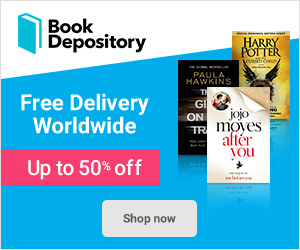 Previous Previous post: Everything Everything – Book Review! Next Next post: Scotland Plans!